School Choice Week is one of the greatest scams in American history. It is a well-funded, thoroughly organized attempt to trick parents into signing away their right to make educational choices about their children. Salesman: Would you like a choice? Salesman: Then just agree to never have another choice again. When you decide to send your child to a so-called choice school – a charter or voucher institution – you lose almost every other choice about what happens at your child’s school. Let me count the decisions you lose by signing on the dotted line. –AN ELECTED SCHOOL BOARD, so you have no say about what the school does. –OPEN DOCUMENTS, so you have no right to see budgets, spending agreements, bids, contracts, etc. –OPEN MEETINGS, so you have no public place to speak up to the people who run your school. –RIGHT TO SELF-GOVERNMENT, so you have no right to run for a leadership position on the school board. Instead you’re at the mercy of appointed flunkies. –THE RIGHT OF ENROLLMENT, so school operators get to choose whether your child gets to attend, unlike public schools which have to accept your child no matter what – so long as you live in the district. –QUALITY SERVICES, so school operators can cut services for your child and pocket the savings as profit or use it to advertise to get more paying butts in seats. 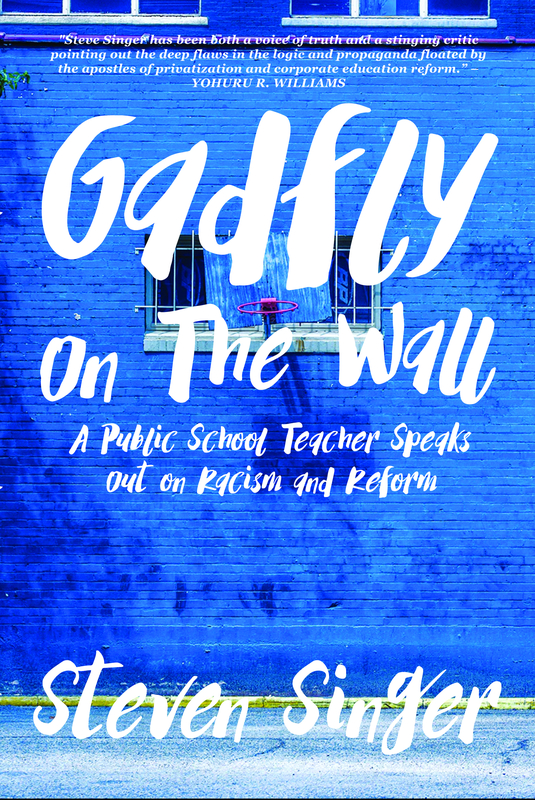 –QUALITY TEACHERS, because most charter and voucher schools aren’t required to hire educators with 4-year degrees, and since they don’t pay as well as public schools and often refuse to let their teachers unionize, they attract less experienced and distinguished educators. –DIVERSE CLASSMATES, because charter and voucher schools increase segregation. Your children will be educated with more kids that look just like them. That’s healthy! –COMMON SENSE DISCIPLINE POLICIES, so your children will be held to a zero tolerance discipline policy where they may have to sit quietly, eyes forward, marching in line or else face aggressive public reprimands and harsh punishments. –AN UNBIASED SECULAR EDUCATION, so your children will be taught religion and politics as if they were fact – all funded by public tax dollars! Hear that sound? That’s our Founders crying. –FREE TIME, so you’ll be required to volunteer at the school regardless of your ability to do so. Gotta’ work? Tough! –MONEY, so you’ll have to pay tuition, buy expensive uniforms, school supplies or other amenities. –ENROLLMENT, so your child is given the boot back to the public school because he or she is having difficulty learning, and thus costs too much to educate. You lose all that if you decide to enroll your child in a charter or voucher school! If you DON’T decide to send your child to a so-called choice school, you can still lose choice! Why? Because of the rubes who were fooled into give up their choice. When they did that, they took some of your choices, too. -NECESSARY FUNDING, because your public school has to make up the money it lost to charter and voucher schools somewhere, and that means fewer resources and services for your child. -LOWER CLASS SIZES, because your public school has to fire teachers and increase class size to make up for lost revenue. -FAIR ASSESSMENTS, because the state and federal government require your child to take unfair high stakes tests to “prove” your public school is failing and thus justify replacing it with a charter or voucher school – as if those have ever been proven to be better, but whatever! CA-CHING! CA-CHING! This is what you get from School Choice Week. It’s a uniquely American experience – selling the loss of choice — as choice. And all the while they try to convince you that public schools are the ones that take away your alternatives. Yet public schools are where you get all those things you lose at privatized schools. You get elected school boards, open documents, open meetings, the right to self-government, the right of enrollment, quality services, quality teachers, diverse classmates, common sense discipline policies, an unbiased secular education, free time and money! That’s right! You actually get all that and more money in your pocket! I’m not saying public schools are perfect. There are many ways they need to improve, but it’s difficult to do so when many of the people tasked with improving these schools are more concerned with sabotaging them to make room for privatized systems. These are paid employees of the charter and voucher school movement who want to kill public schools – BUT THE KILLER IS ALREADY IN THE HOUSE! Imagine if we dedicated ourselves to making our public school system better! Imagine if we committed to giving parents and students more choices in the system and not trying to replace that system with one that gives all the benefits and choices away to corporate vultures! So, yeah, School Choice Week is a scam. But, hey, enjoy those yellow scarfs. They don’t look like a duck. They don’t quack like a duck. Do you really want to serve them confit with a nice orange sauce? Sure, charters are funded by tax dollars. However, that’s usually where the similarities end. They don’t teach like public schools, they don’t spend their money like public schools, they don’t treat students or parents like public schools – in fact, that’s the very reason they exist – to be as unlike public schools as possible. Advocates claim charters exist as laboratory schools. They are free to experiment and find new, better ways of doing things. Once they’ve proven their successes, these improved practices will eventually trickle down to our more traditional houses of learning. At least, that’s the ideal behind them. But to my knowledge it’s never happened. As a public school teacher, I can never recall being at a training where charter operators taught us how to do things better with these time-tested strategies. I do, however, recall watching excellent co-workers furloughed because my district had to meet the rising costs of payments to our local charters. Moreover, if the freedom to experiment is so important, why not give that privilege to all public schools, not just a subset? Charter schools are choosey. They don’t take just any old students. They only accept the ones they want. And the ones they want are usually easy and less expensive to teach. However, sometimes the bait-and-switch isn’t so obvious. Occasionally, charters actually do accept special needs and/or difficult students – for a few months. Then when the big standardized test is coming up, they quietly give these kids the boot. That way they can claim they accept everyone but still get excellent standardized test scores. Keep in mind, this situation is allowed by law. Charters are legally permitted to discriminate against whichever students they want. By contrast, traditional public schools accept all students who live within the district. It doesn’t matter if children have special needs and therefore cost more to educate. If a child lives within district boarders, your neighborhood public school will take him or her in and provide the best experience possible. Bean counters complain about poor test scores, but traditional public schools aren’t gaming the system. They aren’t weeding out difficult students. They take everyone. Administrators have no choice. This is dictated by law. Public schools are equal opportunity educators. Have you ever been to a school board meeting? Ever listened to school directors debate the merits of one course of action versus another? Ever looked over public documents detailing district finances and how money is spent? Ever read over bids vendors provide for services? Ever spoken at a public meeting to school directors about what you think is the best way to proceed in a given situation? Ever had a school director or two disappoint and then worked to vote him or her out of office? At traditional public schools, you can do all of this – even if you don’t have any children in the school system! At a charter school, you’re out of luck. Charters rarely have to tell you how they spend their money, rarely debate management decisions in public, rarely invite or even permit you a seat in the audience. Heck! They don’t have to! Charters survive on public money, but once that money goes in those charter doors, the public never sees it again. If you don’t like how the charter is treating your child, you can remove the little dear from the school. But if a non-parent doesn’t like how they suspect the charter is spending his or her tax money, there is absolutely no recourse. You are taxed without any representation. Wars have been fought over such things. It’s hard to imagine how that can be Constitutional. In sum, traditional public schools are like most other government organizations. They are required by law to be transparent to the public. Charter schools, however, are money pits and what goes down those gaping holes is lost forever from public view. Have you ever seen those huge billboards by the side of the road trying to convince motorists to send their children to a charter chain? Ever hear a radio advertisement about how happy little kiddos are at Brand X Charter School? Those advertisements cost money. Your money, to be exact. You paid for those commercials. And what’s more, every penny spent on those glossy advertisements is one less that actually goes to educate your child. By contrast, traditional public schools are not allowed to advertise. All their budget dollars have to be spent on things broadly educational. They have to spend on books, teachers, building upkeep, etc. Not only are charters allowed to keep quiet about how they spend their money, even if they told you, it doesn’t all have to be spent on the children in their care. What could possibly go wrong with that? Despite all their best efforts at secrecy, charter school operators have been caught in countless financial scandals in recent years. According to Integrity in Education, $200 million in taxpayer money was lost, misused, or wasted in just 15 of the 42 states that have charter schools. Mountains of evidence demonstrate fraud throughout the country: Schoolchildren defrauded in Pennsylvania; “out-of-control” charters in Michigan and Florida; rampant misspending in Ohio; bribes and kickbacks, also in Ohio; revenues directed to a for-profit company in Buffalo, NY; subpoenas for mismanaged charters in Connecticut. Heck! In California alone, $100 million in fraud losses were expected just last year. And that’s just the fraud we can see! I’m not saying our traditional public schools are scandal free, but nothing like this level of malfeasance has been revealed. Traditional schools are under much stricter regulations. People are actually watching to make sure nothing like these charter scandals happen at our time-tested neighborhood schools. They are much better value for your money. It all comes down to teaching and learning. When we compare the results at charters versus traditional public schools, who does better? Bottom line: the research shows that the overwhelming majority of charter schools are no better – and often much worse than traditional public schools. This is true even of studies backed by the charter school industry, itself! That’s not exactly a record of success! Meanwhile, our traditional public schools often do a much better job. The National Assessment of Educational Progress (NAEP) reports that U.S. math and reading skills have improved for all levels of public school students since the 1970s, with the greatest gains among minority and disadvantaged students. Other results indicate that our schools achieve even greater success when properly funded. The facts seem pretty clear. Charter schools are not like traditional public schools at all. Most charter schools are a losing prospect for our children and our Democracy. Yet well-funded corporate lobbying interests continue to push charters as a public policy solution while instigating the closure of an increasing number of traditional public schools. This is like closing hospitals and opening clinics on the power of crystals, snake oil and phrenology. We need a national moratorium on new charter schools. We need to investigate every existent charter to determine if each are providing a quality service to students and not just the charter’s corporate share holders. We know what works, and it isn’t charter schools. Support your friendly, neighborhood, traditional public school.